1930 Massachusetts INSPECTION sticker - $20.00 : Bob Hoyts Classic Inspection Stickers, Add a Final Touch to your Restoration! 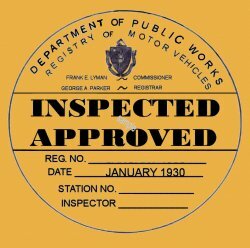 This 1930 Massachusetts Inspection sticker was restored and reproduced both front and back, identical to the original. It can be ordered with your own Car license number on the front along with your own choice of inspector and station number for an additional $10.00. NOTE: In 1930 Massachusetts issued a registration sticker, probably as evidence that the car was legally registered. If you want your car to be historically correct you need yo go to our 1930 Registration site.